Get adventurous with the 2019 Jeep Compass! With 4×4 capability and exceptional efficiency, the new Compass will make you want to explore a little further. No need to stress about the weather forecast, the available snow and rain-ready features will make you feel more prepared than ever. 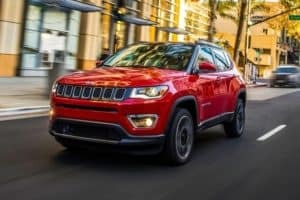 Visit Wabash Valley Chrysler to test drive the impressive 2019 Jeep Compass! Serving Peru, Indiana.